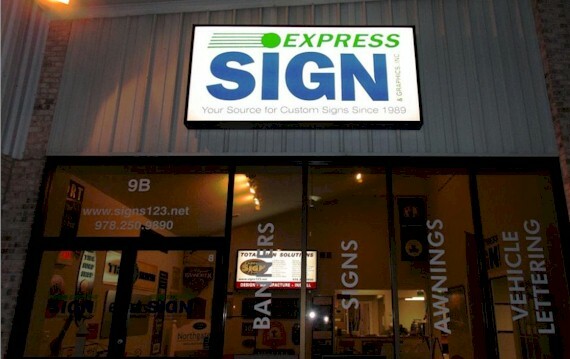 FAQ - Buying Signs FAQ | Express Sign & Graphics, Inc. These are the questions you should be asking before you purchase a new sign. Signs can take various forms and perform various functions depending on, who it’s for, what it’s for, where it’s for, when it’s for and why it’s needed. From the basic door nameplate sign to large airport and arena signage programmes, there is a vast array of sign sizes and types available to choose from. The amount of signs on offer can be a bit overwhelming to be honest. That’s where you need a reputable sign company, not only to help steer you through the various options but also produce and install the type of signs that will work best for your business. What type of signs should I choose? It depends on what function you want the sign to perform, where you are located, what type of business you are in, what type of impression you wish to project and who you wish to attract to your business. We can advise you on the right sign solution for you, just call our office. Depending on scheduling, stock availability, complexity and size, a sign could be produced the same day or after a couple of days. For most moderate signage projects, we like to allow 2-4 weeks. Obviously, the larger the project the longer the time scale. We will provide likely production times with all our proposals. Again it depends on the type of sign you select. It’s difficult to give an accurate cost until the design has been finalised. However, we do provide full written quotations with all our proposals. Why do some types of signs seem expensive? Sign costs are directly linked to the nature, level of sophistication and technologies used in the manufacture and installation of any given sign. From a flat panel sign which, depending on scale, could take a few hours to produce, up to several days, or even weeks, to design, engineer, manufacture and install more advanced sign types. Aren't all sign companies the same? Definitely not! In recent times there has been a plethora of ‘sign’ companies appearing in the market place, leaving potential customers with an absolute minefield to navigate through. Although is would seem at first glance, that there is a wealth of choice from sign companies, the truth is, that most are just ‘graphics’ companies and will be short of the basic understanding of engineering required to actually fabricate and manufacture proper signs. Some companies will take advantage of the understandable lack of intimate sign knowledge that most prospective customers would have. Any ‘sign’ company will sell you a sign, but a frightening amount fail to appreciate the true purpose of a sign and what it is supposed to achieve for the customer. What should I consider before buying a sign? We would advise that you ask a lot of probing questions, like: Who has the knowledge to offer practical advice? Who is going to produce the sign? Do they have the appropriate portfolio? What type of signs can they produce? Am I satisfied that I have been given all the information needed to make an informed choice? What experience does the company have? Do they have a track record? Do they have enough appreciation of my business to offer me the correct sign solution? It is best to ensure you are dealing with a long established, bona-fide, legitimate, registered company, before parting with your hard earned cash.